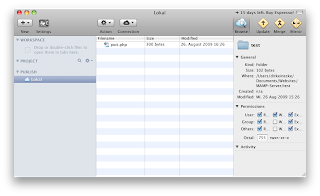 We already showcased how to start the built in FTP server of Mac OS X and how to access it with the FTP Client FileZilla. 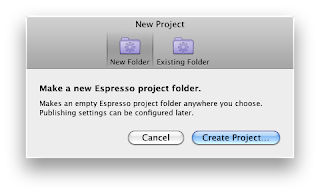 Click on "New Folder" and choose "Create Project"
Enter a name into the field "Nickname". 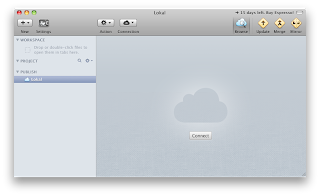 I'm choosing "Local"
Enter your IP address into the field "Server". Not sure about your IP? Take a look at our post "How to: Access FTP with MAMP"
Enter your user name into the field "User Name"
Enter the favored directory into the field "Remote Path". On my System this is: "/Users/dirkeinecke/Documents/Websites/MAMP-Server/test"
Now you will see a button "Connect" on the right. Click it. The connection has been established and you are done!